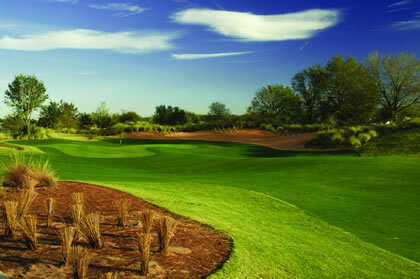 Located at the beautiful Mystic Dunes Resort & Golf Club just two miles from Walt Disney World® in the heart of Central Florida, the 7,012 yard par 72 public course offers two distinctly different nines. The front nine is reminiscent of classic Carolina courses, meandering through native wetlands and marsh areas, bordering oak and cypress forests. The back nine features the characteristics of a British Isles links course, with extensive perimeter mounding, pot bunkers, and lush fairways. Elevation changes of up to 80 feet, greens reminiscent of Augusta National, rolling sand dunes, mature oaks and large wetland areas, meticulous course conditioning and five sets of tee boxes offer a unique and memorable experience for golfers of all skill levels.